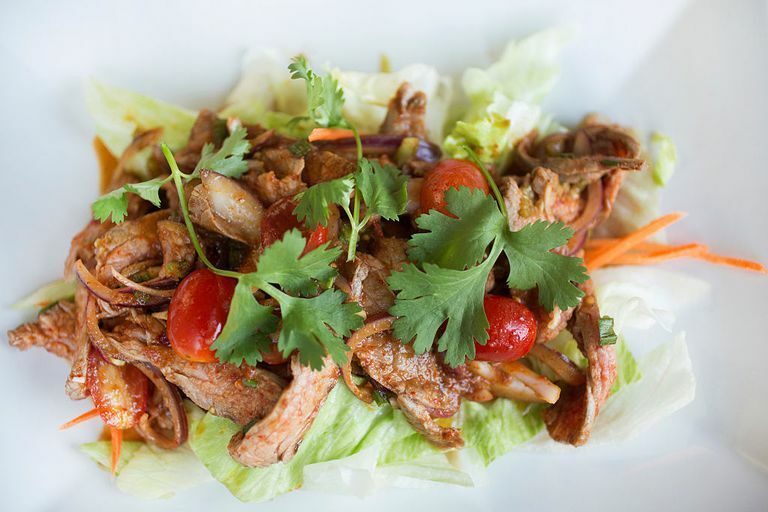 If you love light, fresh vegetables, seafood, and meat then you'll love many of the healthy menu items at Thai restaurants. But not everything on a Thai menu is healthy. Find out what to order and what to avoid to keep your healthy eating program or weight loss plan on track when you eat Thai food. Many of the menus at Thai restaurants are quite extensive. If you are not familiar with Thai food, you might get overwhelmed trying to navigate page after page to find healthy fare. Remember that you can always ask your server for a suggestion. But be clear about whether or not you want foods that are low in calories, low in fat, or low in carbohydrate. If you simply ask for "healthy" food, you may not get a meal that fits your needs. Many traditional Thai restaurants serve curries. While you might be familiar with the common spice blend called curry, a "curry" served in a Thai restaurant is slightly different. Thai curries are creamy dishes (sometimes even called "soupy") that usually include coconut milk, curry paste, vegetables, herbs, and meat or seafood. Curries come in different spice levels such as a spicy red curry, a sweet and spicy green curry, lightly sweet and spicy Panang curry, or the mild massaman curry that is often sweet and peanutty. Curries can be higher in calories because of the coconut milk that is usually one of the main ingredients. But if you order a very spicy curry, you may eat less of it. Many diners find it difficult to overeat very spicy foods. If you prefer less spicy food, there is still plenty to enjoy on a Thai menu that will keep your diet on track. Fresh meat and seafood, fruits, herbs, and vegetables are all popular ingredients in Asian food. One of the most popular dishes on a Thai menu is pad Thai. Pad Thai is stir-fried rice noodles with egg, bean curd, bean sprouts, scallions, and crushed peanuts. There is usually some variation in the dish from restaurant to restaurant. You often order pad Thai with meat, seafood or tofu. Because there are different variations, pad Thai calories can vary as well. While the dish isn't usually the highest calorie option on a Thai menu, it does provide significant calories because it is stir fried using oil and because the dish includes peanuts. Pad Thai nutrition is sometimes called into question because of the sugar in the dish. Most people don't expect a savory dish to be high in sugar, but a single serving provides 20 grams. If you're trying to cut back on sugar in your diet, consider choosing a different entree. Lastly, pad Thai is high in sodium, so it may not be the smartest option for those watching their salt intake. What about other nutrition for other popular dishes? Many dishes on a Thai menu are made with rice or with cellophane noodles. These are clear noodles made from starch and water. According to USDA data, one cup of cellophane noodles provides 492 calories, 121 grams of carbohydrate, and less than one gram of fat and protein. If you want to keep your calorie and fat intake low when you visit a Thai restaurant, scan the menu for any of these options. Thai spring rolls. ​These rolls usually are made with fresh shrimp, vegetables and/or tofu. They are wrapped in clear-ish spring roll wrappers and not fried. Soups. While some soups in Thai restaurants are made with coconut milk, the healthier soups are made with clear broth and include chicken, beef or tofu with vegetables and herbs, scallions, or garlic. Thai salads. Many of these fresh, light salads are made with mixed greens, cucumbers, tomatoes, shallots, or tofu. They are often served with peanut dressing or a citrus vinaigrette dressing. Chicken sate. ​ These skewered chicken breast appetizers are marinated with herbs and grilled. They are often served with dipping sauce. You will also find many stir fry choices on a Thai menu. Many of them might be slightly higher in fat because of the preparation method, but if you keep your portion size in control, these dishes can provide healthy servings of lean meats and vegetables. So what should you avoid to stay healthy at a Thai restaurant? Skip the foods that are fried. Fried wontons or crispy rolls are popular on many menus and provide little nutrition. You might also see fried calamari or fried fish cakes on some menus. If you want to be very careful about calories, skip the peanut dipping sauces as well. Some of them are high in fat, high in sugar and high in calories.